The state of Utah approved a $27.3 million incentive package Thursday for financial services firm Goldman Sachs, bringing the total amount the company stands to collect to $47.3 million. The money, one of the larger incentive packages ever offered by the state, is in the form of a tax credit payable over the next 20 years. The incentive money is based on the fact that the company has been expanding in Utah and plans to double its 500-member work force by the end of next year. The offer was approved by the Governor’s Office of Economic Development board, made up of private-sector members of the business community. Like other companies asking the state for taxpayer money, Goldman Sachs has told Utah officials that the firm might expand elsewhere if it wasn’t given the incentive. Goldman Sachs, which was among a number of financial services firms that took billions in dollars in federal aid and repaid it, is one of the few banking companies in a position to expand. Board members say that’s one of the prime reasons they approved the deal, which is the third incentive for the company approved since 2001. “There’s a risk they could expand elsewhere,” said attorney Jerry Oldroyd. Derek Miller, acting director of GOED, said the deal plays well into Gov. Gary Herbert’s emphasis on aiding expansion for businesses that already operate in Utah or are based here. 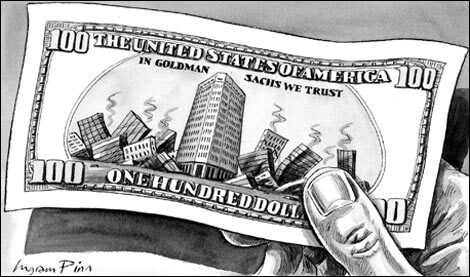 In 2001, the state granted Goldman Sachs a $400,000 incentive package in recognition of it opening an office here, and another $20 million in 2007 to expand in the Salt Lake area. The company has received all of the original $400,000 incentive. It has received $100,000 of the $20 million offered in 2007. The remainder will be combined with the $27.3 million approved Thursday and be paid out over two decades as the company operates in Utah and pays taxes. Goldman Sachs will receive a credit on its tax returns for a fraction of the incentive amount over that time period — as long as it stays in Utah. Even though the company will get a tax break, state officials said they expect to collect $157 million in new state tax revenue from Goldman Sachs over the 20-year period. The company operates in the University of Utah’s Research Park, but is looking for new, larger digs. One option, according several to real estate sources, is the new high-rise being built in downtown Salt Lake City at 222 S. Main St.